"He's a hard man to reach." 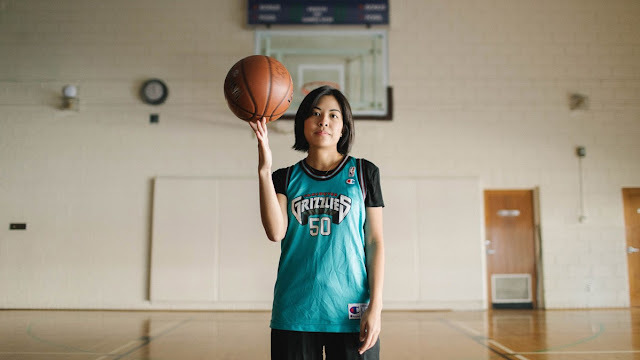 VIFF 2018—The legacy of Vancouver's only ever NBA pro basketball franchise, the Grizzlies, is a curious one. Essentially lost to time due to years of losing records and dire mismanagement, their place in the city's sports history isn't exactly a fond one. That's where local filmmaker and lifelong self-described superfan Kathleen S. Jayme comes in with her Storyhive documentary Finding Big Country. Jayme's film recounts the NBA team in the context of her own experiences as an athlete and the franchise's most notable star, the elusive seven-foot-tall Bryan "Big Country" Reeves. He left public life for good after his retirement due to injury during their move to Memphis. Through interviews with friends and family, we see the very nice Oklahoman's history with the sport, his hometown of Gans (a population of 302), and Vancouver's mixed feelings towards the Grizzlies. As a documentarian, Jayme's wisest decision was to jampack the brisk 44-minute film with as many personal stories from not only Vancouverites, Oklahomans, but that of her own family as possible. As a high school basketball standout, she parallels her own journey as an artist with that of Reeves' country roots and retreat from any spotlight. Jayme does a remarkable and economic job putting together her personal story with that of her favourite sports team. The archival footage, use of relevant interviews, and quick editing really capture a moment in time from a fan's lens while interpreting a kid-like tale of meeting your childhood hero. Finding Big Country hits all the points. It both triumphs and suffers from all the usual hallmarks of heartwarming, inspirational sports stories but is a thoroughly pleasing experience for anyone vaguely familiar with the Grizzlies. It serves as a fine epilogue to a forgotten era of Vancouver sports and the man himself—not that he needed or wanted one. Finding Big Country premiered at the 2018 Vancouver International Film Festival as part of the Sea to Sky and BC Spotlight streams. It also screens at the Rio Theatre. It's now available for streaming on YouTube (below).